Feeling so lucky, so grateful. Being able to go to concerts to see talented artistes and great brands playing. Just saw The Script, then Charli XCX and it's Thirst tomorrow! Malaysia is picking up, not too bad but still not as good as Singapore. 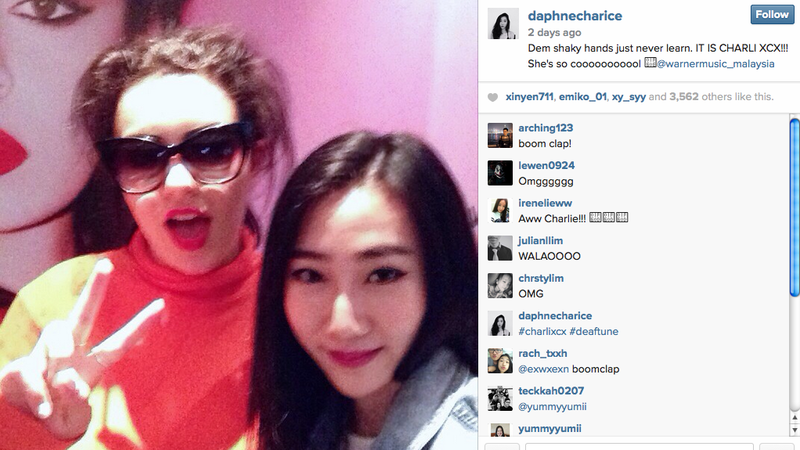 Charli XCX didn't come to Malaysia but she went to Singapore. I learnt something after missing Ed Sheeran's first ever + tour. I didn't go to Ed Sheeran's first concerts in Aussie, biggest regret ever. That's why I flew thousand miles to Aussie to see Kodaline, their first tour closest to me. And it's also why I didn't want to miss Charli XCX's first Asia tour. Thanks to Warner Music Malaysia for hooking up. Thank you for appreciating my enthusiasm in music, lol. Arrived at Hard Rock Hotel in the evening. We could only check in at 3.30pm. You need to pay to watch movies in your room. There's no free internet at all, you'll have to pay for internet. The hotel room rate really isn't cheap, hmmmmmm. It's triple the price of so many good hotels I've stayed in Singapore. Ok, back to my great mood after checking in. I started to get ready because we were all scheduled to meet Charli XCX at 5:30pm. I was super excited, I actually picked out outfit to maych Charli XCX's style. Don't think I was anywhere close to her punk style. Crop top and white denim skirt. Kinda got inspired by watching Charli XCX's music videos! White denim skirt gave me that 80's 90's feeling, no idea why. Oversized denim jacket and red lips!!! I played safe, not as daring and as badass as her. She's so cool, such a badass, wish I was as "fierce" as she is. Paired with striking blue Air Max 1 Ultra Moire. We waited with the fans of Charli XCX from Singapore and Malaysia. Everyone was nervous and excited. I was trying if my camera was working fine. I don't want to repeat the same mistake again. Starring at Ed Sheeran and took a selfie with shaky hands. Oh well, again, my hand was shaky but hey, not complaining! Still a legendary picture with Charli XCX. She just swung in really casually, "hello guys!". She has got that "fierce" and confident attitude but friendly and nice, down to earth. Charli XCX with the crew from Warner Music Malaysia and Singapore. Charli XCX's live performance is as great as her recordings. It's crazy, she hit every single high note. She's very very very energetic on stage and she's so "fierce". She rocked the stage with her punk and daring style. It's really hard to put it in words. Her style is extremely unique. I'd describe her music as pop punk, electropop, indietronica. Reminds me of Avril Lavigne in the older days, lol. A little bit of Britney Spears, kinda think she sounds like Gwen Stefani though. I'd pick "Fancy", do you guys know that she wrote that song? "Boom Clap" is the most epic song! I like "Doing It" too, very catchy. "Superlove" is one of my favourites. She is also the support act for Coldplay, Ellie Goulding, Paramore and more. She's only 23, I'm 23. Finally took her shades off. THANKS FOR THE GREAT TIME, CHARLI XCX!! !